1768c. 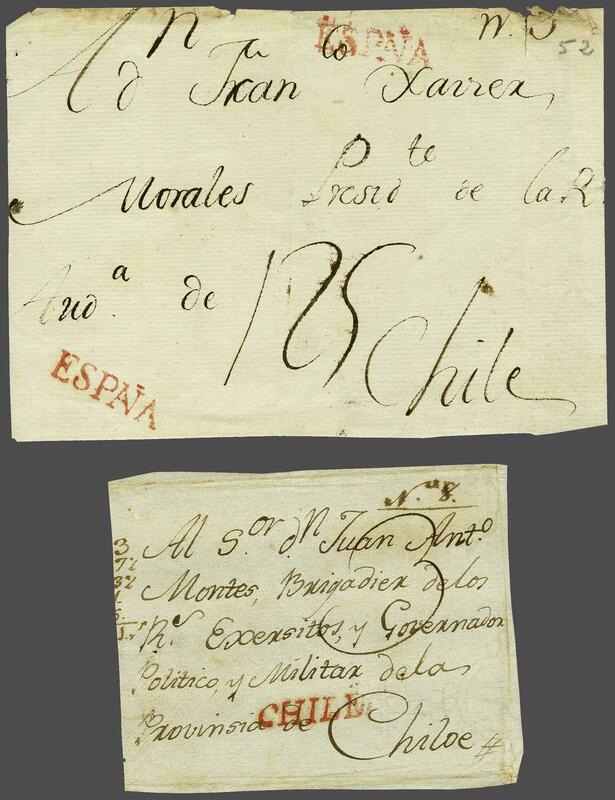 : Cover front addressed to Francisco Xavier de Morales, President, Governor and Captain General of the Real Audiencia de Chile, struck twice with straight line ESPAÑA truncated handstamp in red (probably applied at Rio de la Plata), annotated '125' (reales) in manuscript. Morales held these offices until 1772. A scarce and very early usage, together with a circa 1794 front to a Brigadier at the fort on the island of Chiloe struck with CHILE handstamp in red rated '3' reales in manuscript.rnProvenance: Corinphila sale 90, Oct 1994, lot 6448.